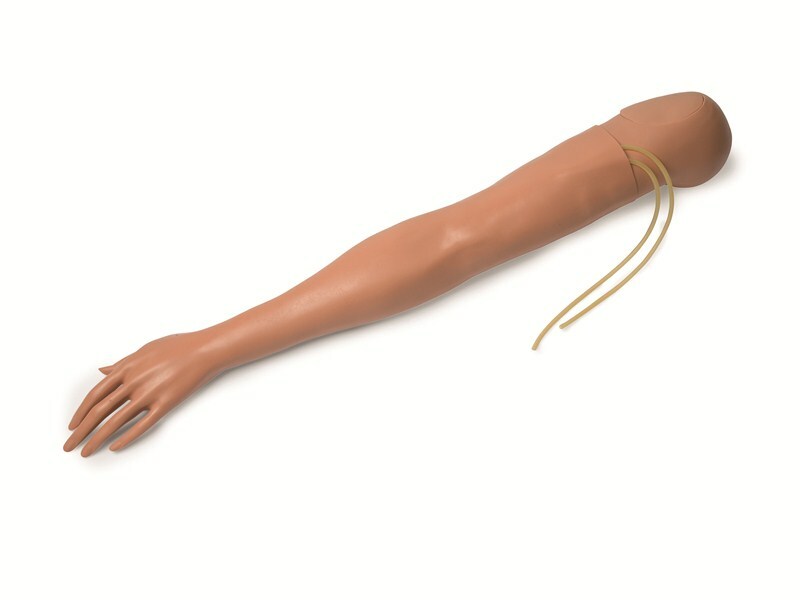 Lifelike female arm reproduction (left) in tan skin tone with replaceable skin and multi-vein system designed for peripheral intravenous therapy. Injectable deltoid pad for intramuscular and subcutaneous injection practice. Arm will articulate to Nursing Anne manikins. Includes: 1 Female Multi-Venous I.V. Arm, 1 Deltoid Pad, 1 Can of Manikin Lubricant, 1 Bottle of Simulated Blood and 1 Shoulder Attachment Hardware Set. *Replacement Skin & Multi-Vein System to fit this arm is available for purchase using catalog number 325-00350T.